Indian Point Nuclear Reactors Unit 2 and Unit 3 regularly release greenhouse gases and radioactive isotopes into the air and water just like all other commercial reactors. The discharges are allowed by the Nuclear Regulatory Commission. Releases are monitored as they leave the plant and amounts are reported annually. Under the Clean Water Act, Entergy is required to have a discharge permit from the State of New York for any releases to the Hudson River. The question is – do we need to tolerate these discharges or, put another way, do we need the electricity produced at Indian Point? The answer to both questions is no, we do not. Many different reports and agencies have documented this fact. We have a surplus of electricity in our grid and plenty of electricity providers. 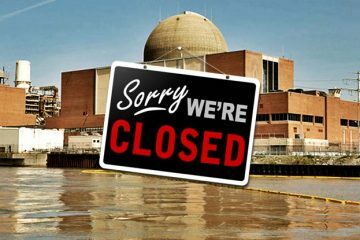 Therefore, Indian Point could close and not even be missed. The closing would be carbon-neutral since no replacement generation is needed. What is needed is already in place. If Indian Point closed we could eliminate a real and present danger to 20 million people who live and work in the 50-mile radius of the plant. We would also stop accumulating high-level radioactive waste that is lethal for 240,000 years, a toxic legacy for future generations. For more information and documentation of the above statement, continue reading. The Nuclear Regulatory Commission and Entergy, the owner of the plant, acknowledge that tritium is leaking from Indian Point into the Hudson River. It is not known when the leaks began or how much has leaked. Monitoring wells are now operating on the Indian Point property to measure the amount of tritiated water flowing into the Hudson River. The leaks spike during refueling and Entergy now claims that they have found the reason for the spikes and are working to prevent them. All nuclear reactors, including Indian Point, have regular and routine releases to the air and water. It is part of their standard operating procedure. The Nuclear Regulatory Commission allows for these releases and requires Entergy to report on them annually. These allowed releases are what the NRC considers to be “under regulatory concern.” It should be noted that the standards for the amount of radioactivity released were established decades ago. In its latest study the National Academy of Science concluded that any exposure to ionizing radiation is harmful. The Electric Power Research Institute is the research and development branch of the nuclear industry. The budget for EPRI comes from fees paid by reactor owners and it does whatever the industry requests. Their studies clearly state that nuclear power is not greenhouse gas-free. Greenhouse gases are produced when electricity is generated. Here is a link to their study on the amount of greenhouse gases produced as electricity is generated in a nuclear power plant along with a excerpt and brief comment. Estimation of Carbon-14 (C-14) in Nuclear Power Plant Gaseous Effluents, Electric Power Research Institute Technical Report, Dec 2010. In Pressurized Water Reactors (PWRs) like Indian Point, “Carbon-14 is produced in the reactor coolant during power operation, and its production rate increases during the fuel cycle due to increasing neutron flux and ingress of nitrogen… Most of the radioactive C-14 – or methane – is released to the atmosphere via plant venting”. C-14 has a half-life of 5,700±30 years. The International Atomic Energy Agency (IAEA) sets standards for reactor owners around the world. The IAEA has done many studies on discharges including tritiated water leaks, which are a common problem. Here is the link to the abstract of their study with links to the entire document along with some relative excerpts with brief comment. Management of Waste Containing Tritium and Carbon-14, International Atomic Energy Agency Technical Report Series no. 421, 2004. “Radioactive waste containing carbon-14 (14C) and tritium is continuously generated by the nuclear industry” and both 14C and tritium are “mobile in the environment” (pp 3-4). Both radioactive isotopes are emitted in the form of airborne gases and aerosols and liquids to surface water bodies. Carbon-14 and tritium are produced by nuclear power plants. “When released to the environment these radioisotopes are distributed globally, owing to their long half-lives and residence times in the atmosphere and hydrosphere” (pp 94-95). The State of New York is working hard to close Indian Point. Governor Cuomo, while not anti–nuclear, strongly urges the closing of Indian Point because of the danger it presents to 20 million people in the 50-mile radius of the reactors and some of the most expensive real estate in the world. Attorney General Schneiderman has been very active in filing contentions, the legal reasons the plant should not be relicensed, and has won several important court cases on high-level radioactive waste storage. The New York State Department of Environmental Conservation has denied Entergy a discharge permit for hot water into the Hudson River that is part of their once-through cooling system.. This permit is necessary for the continued operation of the plant and a requirement for relicensing. The position of the state is that Entergy must install closed-cycle cooling as the Hudson River ecosystem can no longer tolerate the damage the plant inflicts on aquatic life with the once-through cooling that is currently used. Water usage and fish mortality would be cut 95% with closed-cycle cooling. Entergy has appealed this decision. The New York State Department of State, Bureau of Coastal Management has denied Entergy a water quality certificate, which it needs for relicensing. The Bureau states that it is not in keeping with the best interests of our coastal waters to renew the license for Indian Point. The report cites the billions of fish killed annually, the “taking” of endangered species such as the short nosed sturgeon, among many other reasons. It goes on to document existing ample electricity sources and calls closing Indian Point “carbon neutral” since replacement power is not needed because we have a surplus of electricity already available. Here is a link to the complete report, which begins with a letter to an Entergy official explaining why the permit was denied. Entergy has appealed this decision. Environmental and Grassroots Groups have coalesced around closing Indian Point. Two of the premier environmental groups in the Hudson River Valley, Riverkeeper and Hudson River Sloop Clearwater, are fighting to close Indian Point in court. Other grassroots organizations such as the Indian Point Safe Energy Coalition, which acts as an umbrella for interested groups and individuals, focus on education, citizen awareness and action. The website of each group offers more detailed information about what each one is seeking to accomplish. Common knowledge has it that we need more and more electricity to support our modern lifestyle with all of its gadgets and equipment. Statistics show that this is just not true. Electricity usage has remained flat while the economy has continued to improve. This is because efficiency and conservation have made it possible to get more work out of the same amount of electricity. Demand-response measures, which allows large electricity users to voluntarily curtail their usage during peak load, is another measure that has contributed to reducing peak load. Through intensive advertising, Entergy has created a myth that since the plant is here, all of the electricity it generates is used here. 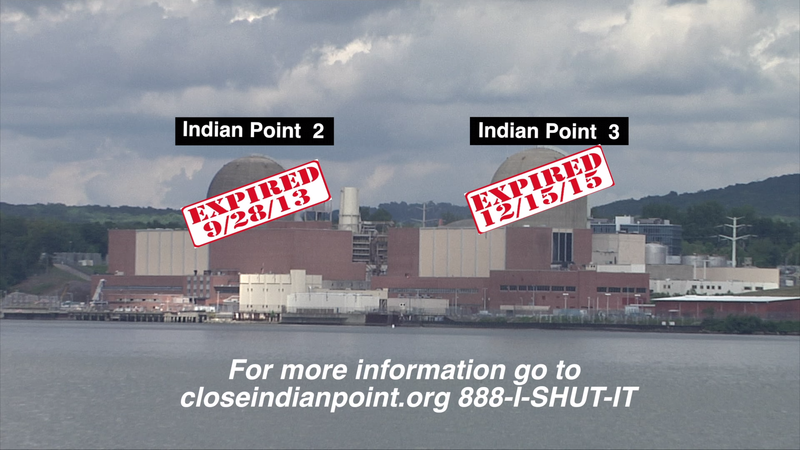 In fact, Indian Point does not supply any electricity directly to residential customers. It sells 500 MW to Consolidated Edison, our transmission company, on a long term contract basis. Con Ed delivers that 500 MW with electricity from other providers to reach the 9,000 MW that our grid consumes on an average day. 25% of that figure would be 2,250 MW. That is more electricity than the 2,000 MW Indian Point produces, even if it were all sold here, which it is not. Indian Point simply does not have the capacity to keep one in four light bulbs burning in our grid, as is so commonly claimed. Where is the Electricity from Indian Point Sold? After the sale of 500 MW of electricity to Con Ed, the rest, 1,500 MW, is sold to the seasonal Mid-Hudson Capacity Market. What is sold into the capacity market cannot be used in the Westchester/NYC grid. In the winter New England uses gas for heat instead of for electricity. This raises their demand for electricity and Entergy utilizes the transmission interconnect at Putnam Valley to sell their 1,500 MW through the Independent System Operator New England. As reported in Crain’s Business Report some of their electricity is used in the Boston area when the prices are favorable. Since they supply only 500 MW to Westchester/ New York City out of an average of 9, 000 MW, that means that the contribution of Indian Point to our grid is between 4 and 5 %. New York has a surplus of electricity, as the Bureau of Coastal Management Report and other sources document. Whether an outage at Indian Point is planned as it is for refueling, or unexpected, as has happened frequently in 2015 and 2016, the Independent System Operators quickly switch to another source, one of the 320 other electricity generators in our state, and there is no interruption in service. Consumers are not even aware of the difference. For more information and documentation of the above statement, see sources below.